Born in Winnipeg and of Icelandic descent, John was the son of Frank Fredrickson and Beatrice Fredrickson (née Peterson). He is predeceased by his parents, brother Frank, sister Marilyn, and Marilyn’s daughter Melissa Peppiatt (Freya, Stuart). He is survived by his wife Alix (née Gordon); daughters Kristin and Lisa; son Erik; niece Signy (Lowell, Silas) and nephew Grant Jon Fredrickson; and nieces Francesca Robyn and Marney (Liam, Laura) Peppiatt. John grew up in Vancouver, attending Maple Grove School, Point Grey, Magee and UBC, where he won six Big Blocks in soccer as an undergraduate and received a degree in medicine. 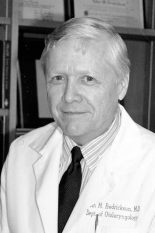 He pursued a long and distinguished career in academic otolaryngology and head and neck surgery, beginning at the University of Chicago, where he interned, followed by the University of Freiburg, Germany, where he was a research fellow, and then Stanford University, where he took up his first teaching position. Returning to Canada, John was head of Clinical Sciences at the University of Toronto for 15 years. Capping his career, he served from 1982 to 2002 as Lindburgh Professor and head of the Department of Otolaryngology/Head and Neck Surgery at Washington University, St. Louis. Over the course of his tenure in medicine, John served as president of the American Laryngological Association, and became a member of the Barany Society Executive, in addition to chairing the Examining Committee of Otolaryngology for the Royal College of Physicians and Surgeons of Canada. John was a member of the American Board of Otolaryngology and served as editor of the American Journal of Otolaryngology. He was a long‑standing member of the prestigious Collegium Oto-Rhino-Laryngologicum, and chairman of the Research Committee for the American Academy of Otolaryngology/Head and Neck Surgery. He was a member of grant review committees for the Medical Research Council of Canada, and the American National Institute of Health. John made significant research contributions to the fields of vestibular neurophysiology and microvascular reconstructive surgery of the head and neck. Recognition for his work continues. Affectionately known as “Bud,” John had a conscientious, kindly presence that was appreciated by all. Ever the athlete, he followed many sports but particularly his beloved soccer. John’s life story would not be complete without mention of his love for jazz and classical music. His has been a unique, eventful life. He will be deeply missed. The family thanks Windermere Care Centre and Dr. R. Menzies. If desired, donations can be made to Parkinson Society British Columbia.